WACO - New homes are rising, existing homes are selling, and improving job figures mean more people can afford them. 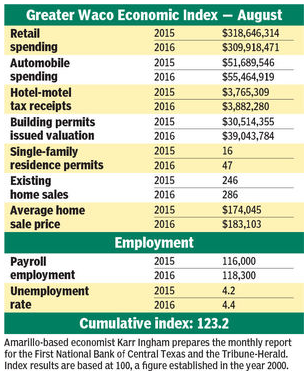 These factors gave the Greater Waco Economic Index a jolt in August 2016, pushing it into record territory, Amarillo-based economist Karr Ingham reported. The Waco Metropolitan Statistical Area, which includes McLennan and Falls counties, continues to see job growth, with the Texas Workforce Commission and Bureau of Labor Statistics reporting 2,300 positions were created in the 12 months between August 2015 and August 2016. Home construction is shifting into high gear, and the City of Waco issued 47 permits for the second straight month in August 2016 for construction of new single-family structures, Ingham said. Ron Nelson, a senior vice president at First National Bank of Central Texas, said a “good bit of activity has begun” on Ritchie Rd. in Waco, near Hewitt and Woodway, where Fort Worth-based D.R. Horton plans a 1,500-home subdivision called Park Meadows. China Spring “is really showing some strength,” and a source told him several lots sold recently in an existing subdivision there, he said.